Downtown Austin is well protected from major flooding events thanks to our Highland Lakes system. The Highland Lakes were formed after constructing a chain of six major dams along the Colorado River between 1938 and 1951. However, what would happen to Austin if the dams did fail? Austin was flooded twice in the early 1900s due to local dam failures. Early dam projects had trouble trying to control the mighty Colorado and actually left the city impoverished for years afterwards. It took federal funds and the founding of the Lower Colorado River Authority (LCRA) to build the current system of dams that protect Austin. 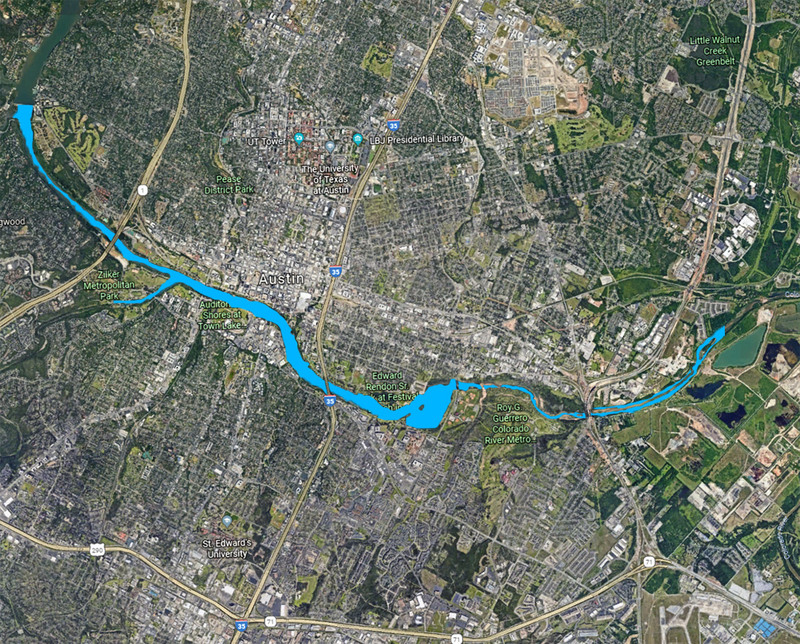 What would happen if the dams that protect Austin were to fail again? Here’s the projections to give you some context on what would happen if the Tom Miller and Mansfield Dams failed, according to the LCRA projections. The Tom Miller Dam is located near Red Bud Trail in West Austin and is the upstream dam that forms Lady Bird Lake. If the Tom Miller Dam were to fail it would cause moderate flooding of downstream areas, namely some of Auditorium Shores and along Cesar Chavez. Past IH-35, areas normally occupied by small creeks will swell and expand to the natural banks for the Colorado and a large amount of Roy G. Guerrero park would be inundated. Damage is largely mitigated due to the relatively low volume of water contained by the Tom Miller Dam. The dam is responsible for holding 21,000 acre-feet back, which is only 1.8% of the volume held back by Mansfield Dam. Mansfield Dam is located by 620 near Lakeway, West of Austin. It is the only dam meant to hold back floodwaters in the chain, making it incredibly important for Austin and downstream cities. If the dam were to fail it would unleash 1.1 Million cu. ft. of water per second.This high flow rate would also continue for a substantial amount of time due to the size of Lake Travis (1.1 Million acre-feet). These projections take into account the subsequent failure of Tom Miller Dam since it cannot withstand the surge of floodwaters. 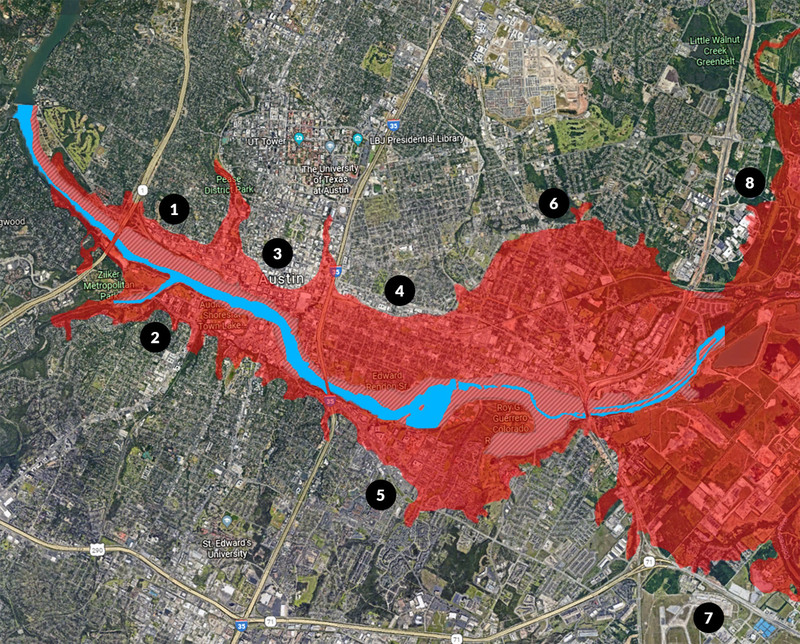 Needless to say, Austin would be heavily affected by a flood of this magnitude, with the potential loss of life in the thousands and the large-scale destruction of Central Austin. The shear destruction by the initial wave of water will be catastrophic. Depending on the size of the breach, a wall of water will be blasted out at speeds in excess of 1,000 MPH and could still be traveling at 50 MPH by the time it reaches Austin. In the Teton Dam failure, initial wave velocity was 1,090 MPH (1,960 ft/s) and the wave was 120 ft tall. The St. Francis Dam failure was an instantaneous failure and released an initial wave of water at 2,018 MPH (2,960 ft/s). These velocities are the result of massive amounts of pressure being created by the weight of the water. The energy within a huge body of water moving at even 20 – 30 MPH are sufficient to obliterate most structures including high-rises and bridges. Even if a structure withstands the initial impact, it must also survive being subjected to continuous force from the waters rushing by, debris strikes, and the potential erosion of the foundation. As we saw in the FM 2900 bridge collapse, the water is more than capable of tossing around entire sections of a bridge like it was a raft. The post Austin Dam Failure Flood Zones appeared first on Lawnstarter.